Sp. Pl. 3 (1800) 681. Erect, much-branched, deciduous, spiny aromatic subshrub, up to 1.3 m high and 0.6-1 m in diameter. Stems subsucculent, young stems smooth, sparsely covered with glandular hairs, green, older stems with bark peeling off in paper-like yellowish-white strips. Subsucculent, glabrous, though with short glandular hairs, dimorphous. Large leaves unifoliolate with long (up to 100 mm) persistent petioles which harden to sharp spines when the laminae are shed, lamina ca 25 mm long and wide. 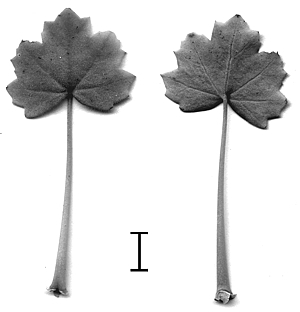 Small leaves simple with short (0.2-0.5 mm) deciduous petioles, borne in axils of large leaves. Stipules subulate, up to 20 mm long, hard, glabrous, persistent, forming thorns. Pseudo-umbel of 3-10 flowers, borne on an unbranched peduncle (14-)20-60(-80) mm long, buds initially pointing downwards. Pedicel (10-)14-30(-40) mm long. 5, elliptical, purplish-green to reddish-green, 15-18 x 2.5-6 mm. Hypanthium 10-23 mm. Petals white to light pink, posterior two narrowly obovate with retuse apices, 29-33 x 9-10 mm, reflexed at 90o, with purple feather-like markings. Anterior three narrowly obovate with retuse apices, 22-25 x 7-8.5, strongly reflexed at >90o, with inconspicuous linear purple markings near bases. 7 fertile, two long, two shorter, one short, two very short. P. spinosum is common on steep mountain slopes in rocky soil, often in crevices, or scattered in dry sandy river beds and on rocky outcrops. The imposing flowering bush on top of this page posed for the photograph near Aus in S Namibia, and the one above, exposing its thorny skeleton during the dry season, is from near Eksteensfontein. This is an unforgiving habitat with plants growing at a truly slow rate, and large plants are exceptional, such as the amazing P. crithmifolium growig nearby. The hilly landscape near Aus, S Namibia, transitioning to the low desert landscape looking towards Sperrgebiet in 2006. Sperrgebiet has opened up for tourism, its botanical diversity being one of the unique aspects used for promotion. van der Walt J. J. A., Albers F., Gibby M. (1995).